The Classic Q-Barlow has been optically matched to the new Baader Classic Eyepieces, and its 2.25x magnification gives a well spaced set of focal lengths. Its removable lens cell can also be unthreaded from the 1.25" barrel and directly threaded onto any of the eyepieces to give 1.3x, further filling in the choice of focal lengths. Alternatively, it can be directly threaded onto the 1.25" barrel of the Q-Turret (sold separately) to give 2.25x. 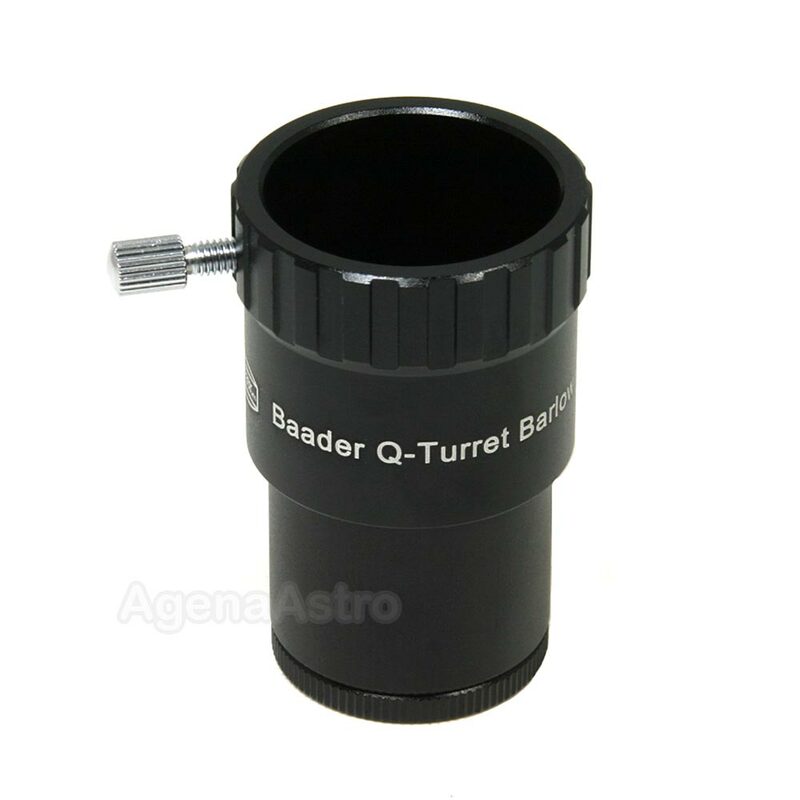 Baader Q-turret 2.25X barlow is a high performing quality barlow eyepiece. Highly recommend. Optically this is a fine Barlow, especially for the price. With the EP inserted into the barrel it is a 2.25x, but with the element removed and threaded onto the filter threads of an EP, it is 1.3x, a nice feature. My only complaint is the compression screw, which can mar the EP barrels. I'd be willing to pay more for a brass compression ring. The thing that sold me on this is the fact that it can be used as 2 barlows. In its own sleeve or screwed into any 1.25" eyepiece. Review by JMTHEOWL of Miami, FL. I use it mostly for planetary observation... and find it very versatile to use the the dual magnification option (1.3x or 2.25x) by threading the lens onto any of my Baader fine eyepieces. The Baader optical quality provides outstanding light transmittance and I get the clearest image imaginable from my refractor.